If you are going to be in the UK 19 – 21 August, don’t miss the Saffron Walden Maze Festival! The Festival will be a whole weekend of celebration of the town’s historic turf labyrinth (known as the maze) on the common, and also of the Victorian hedge maze in Bridge End Gardens. Can you spot the two more modern labyrinths which have been constructed especially for the 2013 and 2016 festivals? There will be an opportunity to hear Jan Sellers give a key note speech on labyrinths in education. She’ll be launching her new book and signing copies too. Jan is bringing her lovely Chartres style cloth labyrinth for a meditative labyrinth walk prior to the talk on Saturday evening, and I will be facilitating another chance to walk the labyrinth from 10.30 – 12.30 on Sunday morning 21st August. You will find us in the historic ‘Court House’ along with maze puzzles and games, and a display of school work from RA Butler and Dame Bradbury’s primary schools. There will be food stalls, live music and plays, an amazing collection of community mazes on the common, and even a ‘night vision goggle’ maze. On Friday 19th there will be an evening comedy club on the theme of ‘I got lost’. On Sunday evening there will be a grand finale with fire jugglers. Also don’t miss the candlelit concert of labyrinth-inspired Indian classical music in St Mary’s Church at 9.15 on Saturday evening. Find out more from the Maze Festival website by following the link below. Aldeburgh author Rosie Andersen has written a beautiful book, ‘Songs of the Trees’ inspired by the woodlands of her Suffolk home. Paul Jackson has supplied wonderful, intricate illustrations. There is a labyrinth to find too! Do follow the link below and take a look. Described as a ‘modern myth’ Rosie’s story is a treat for inquisitive labyrinth fans young and old. Thank you Rosie for getting in touch. I’ve ordered myself a copy! 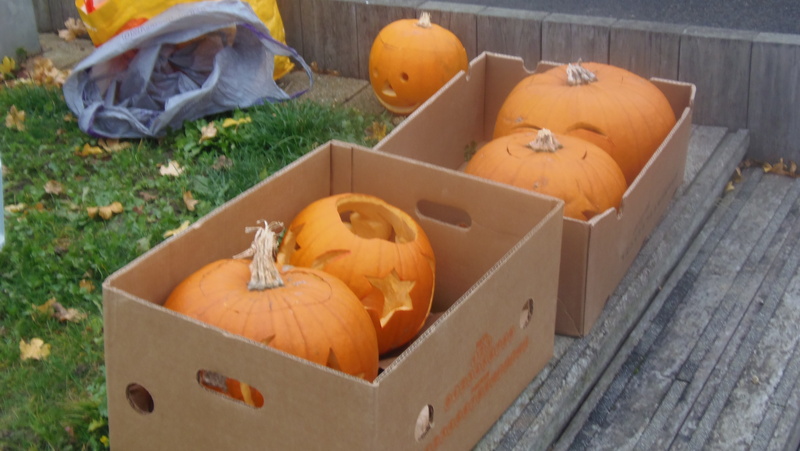 Can you see any pumpkins? 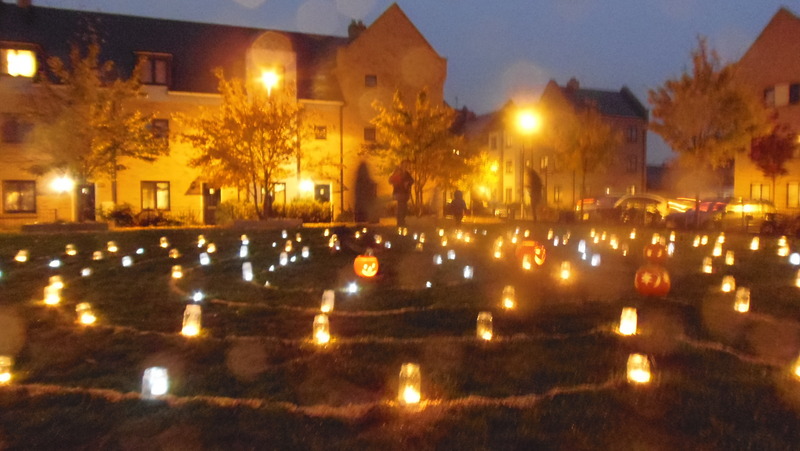 On 24th October we made a special candlelit labyrinth to help ‘Cambridge Sustainable Food’ raise awareness of the problem of food waste and other important food issues as part of their two week ‘Pumpkin Fest’. We had a lot of fun making a corn labyrinth, even though we had to put on waterproofs and work in the pouring rain! Lighting the tea lights in their jam jars was a challenge. Our candle lighters didn’t work properly in the wet weather and breezy conditions. But our fantastic team of volunteers came up with an innovative solution, lighting them indoors and carrying them out in a handy bucket! If you look closely at the photos you might be able to see that we also used a few LED tea lights in amongst the real ones. The LEDs produced a more blueish light than the golden flames of the tea lights. After a lot of effort, finally the magical pathway was ready for our visitors, some of whom had come from quite far afield. Some lucky folk lived in the tall houses round about the community centre and had an excellent bird’s eye view from upstairs. 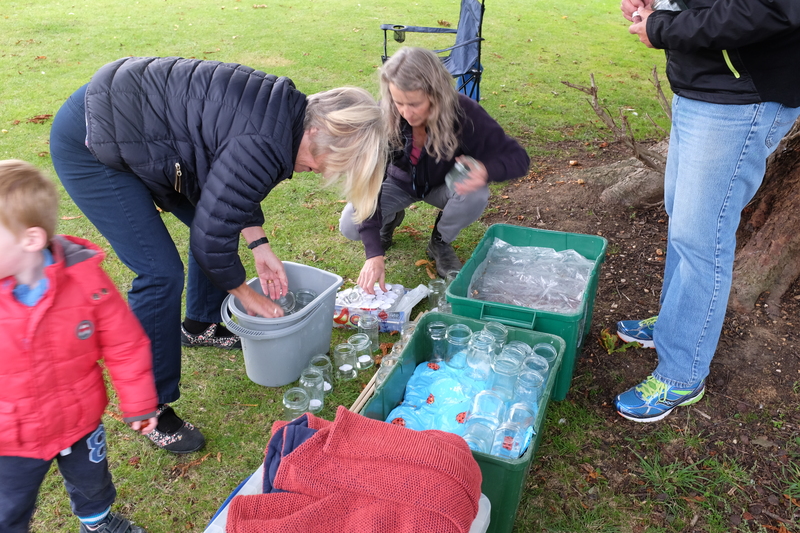 Ann from Cambridge Sustainable Food brought delicious pumpkin themed refreshments, including hot pumpkin soup, and we also gave away orange balloons and leaflets about reducing food waste and becoming a more thoughtful cook and consumer. If you missed it this year, look out for us again next October! 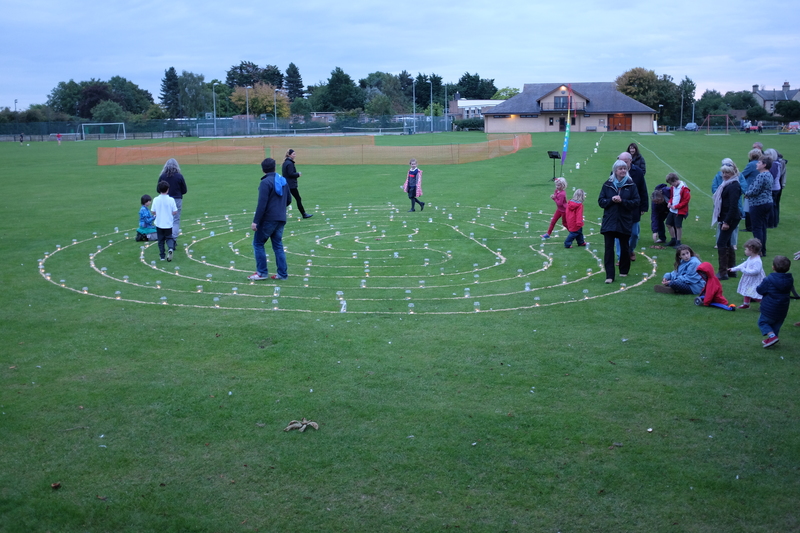 Following on the success of last year’s equinox labyrinth in Girton we decided to repeat the event again. 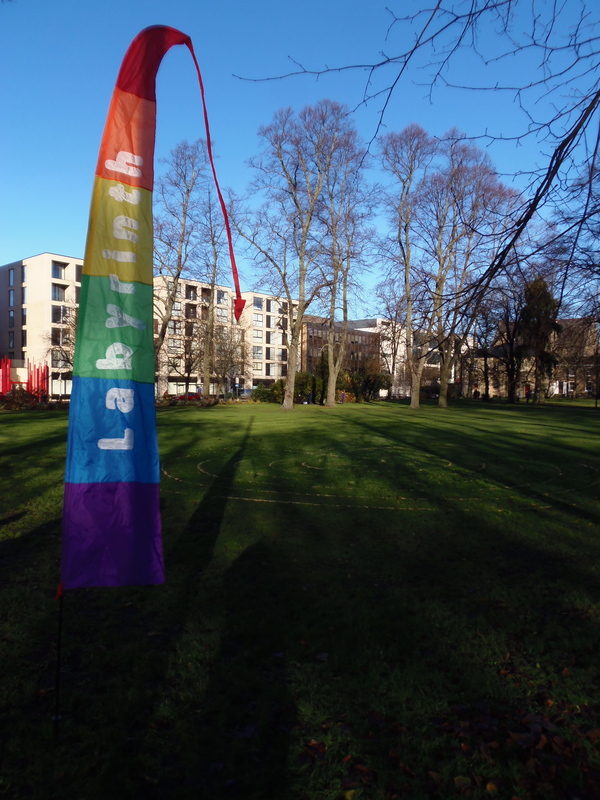 A major attraction, especially for younger visitors, was the lovely location under the horse chestnut trees which border the main recreation ground. We set about collecting conkers and soon had a shining heap near the entrance of the labyrinth. 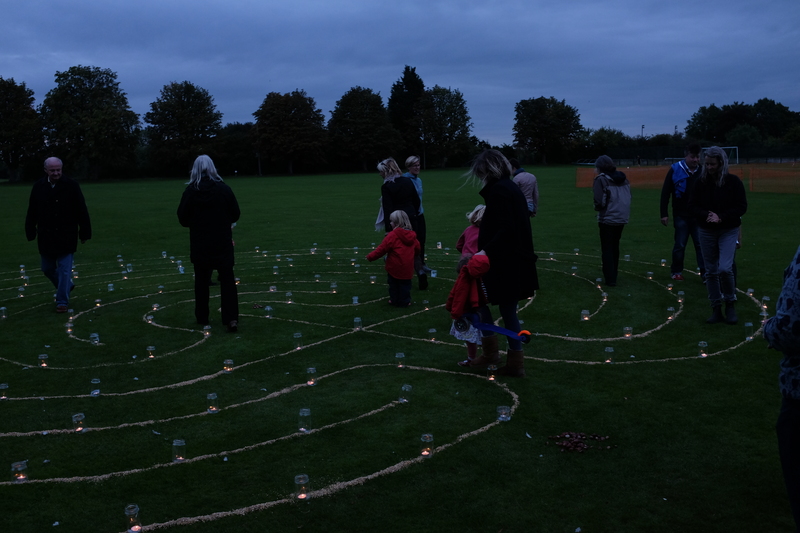 Everyone walking – or running – the labyrinth was invited to pick up a conker and take it into the centre. 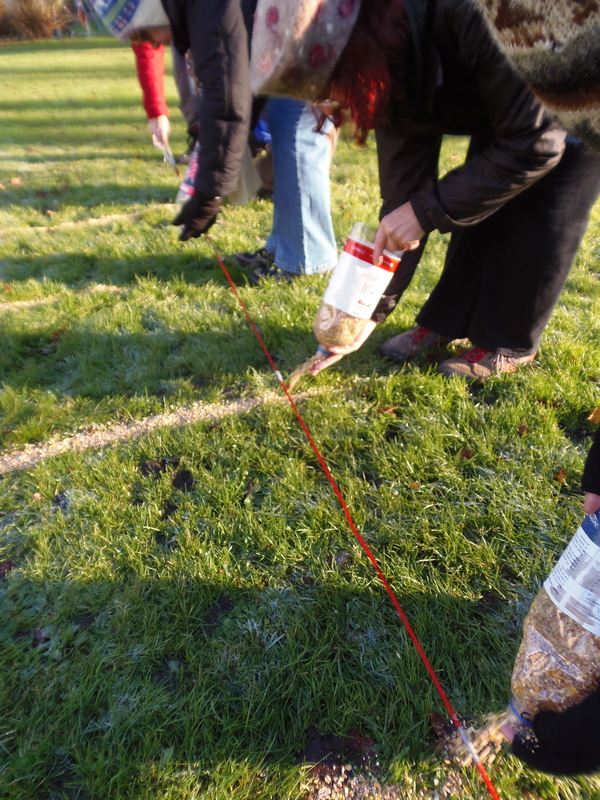 We thought the conker might symbolise something you are thankful for, or perhaps something you need to let go of. Or you might just enjoy the beauty of it and the feel of it in your hand. 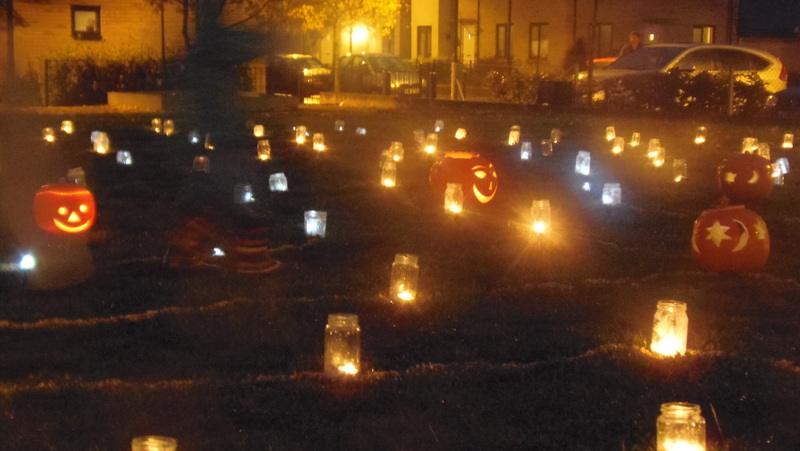 As dusk fell, we lit tea lights in jam jars to illuminate the pathway, and our equinox labyrinth was transformed into a magical pathway of light. 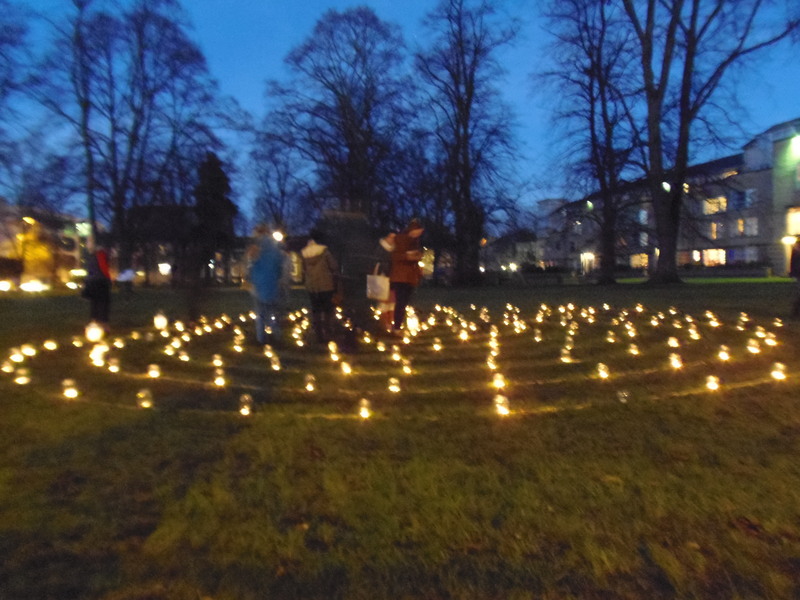 Thank you everyone who came and helped, especially Eve, who showed great skill at pouring the corn for the lines, and Rowan, who worked hard to keep the tea lights lit all through the evening. Brilliant! 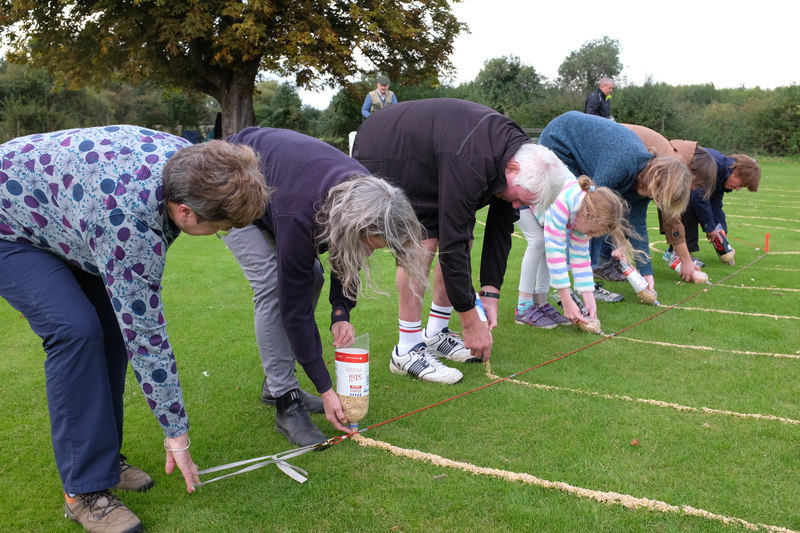 Follow the link below to see a stop motion video of us making and lighting this year’s corn labyrinth at Quiet Waters, in Bungay, Suffolk. Thanks everyone who helped! And to Diana Johnson for the camera work. The excellent music is from the Penguin Cafe Orchestra. This year at Cambridge’s Mill Road Winter Fair we enjoyed a clear blue sky, bright winter sun, and crisp cold temperatures. Thanks to everyone who came and helped or just walked (or ran!) the labyrinth. 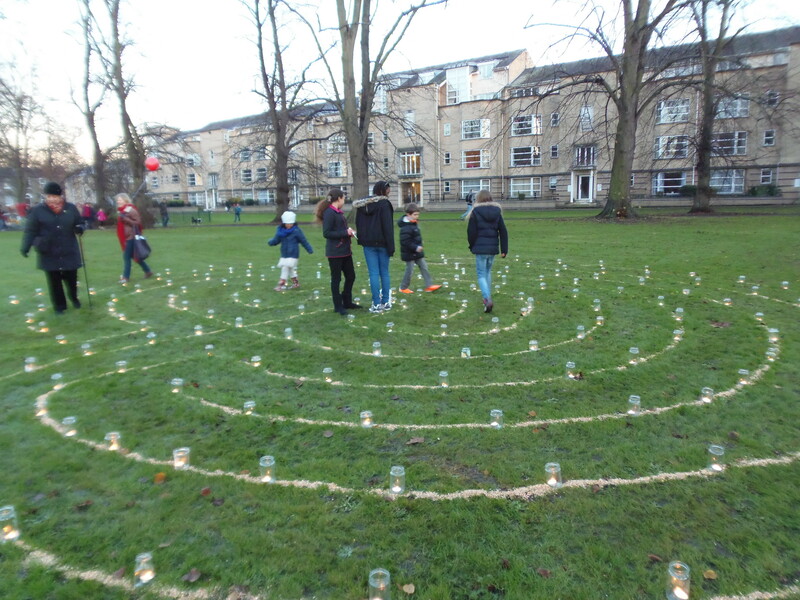 It was lovely to see some people who visited the labyrinth last year return to enjoy it again. I loved walking to the beat of the Arco Iris Samba Band when they passed by in the late afternoon. If you missed it this time – there’s always next year! And do keep an eye on the ‘events’ page for other labyrinth happenings.